The United States has picked up fresh signs of digging and activity at North Korea's nuclear test site, CNN reported Thursday, citing unidentified intelligence and defense officials. The report adds to concern that the North may be preparing to conduct what would be its sixth nuclear test. Last week, 38 North, a website specializing on North Korea analysis, also reported that commercial satellite imagery shows tunnel excavation work is continuing at the North's Punggye-ri nuclear test site in a suspected effort to prepare for a new nuclear explosion. It also said the site is capable of handling a new test on short notice. CNN said that US satellites have watched the site for several weeks and seen fresh signs of digging and activity at tunnel entrances. No further details were given. 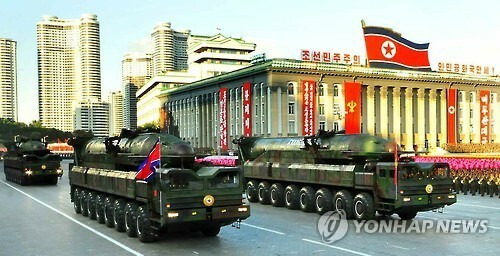 The report also said that the North has moved "some launch equipment" related to an intercontinental ballistic missile. The equipment was observed near a parade ground, but officials are concerned it could quickly become part of an actual launch, the report said. The US has also detected movement of equipment in other areas associated with the potential of mobile launchers firing solid-fueled medium-range missiles, CNN said.